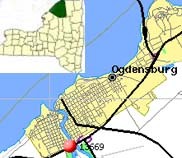 The City of Ogdensburg is located in St. Lawrence County at the upper left corner of New York State along the beautiful St. Lawrence River. It was founded in 1749 by French Jesuit missionary Abbe Francois Picquet to convert Native Americans to Christianity and turn them against the British. The final battle of the French & Indian War which handed control of North America to Great Britain was fought here.